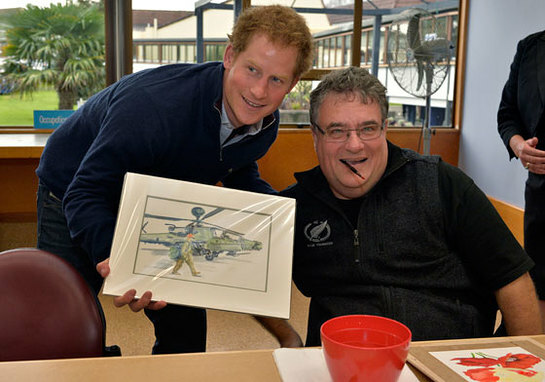 Prince Harry was in New Zealand last week, and took the time to visit the Auckland Spinal Rehabilitation Unit. During his visit, he met All Blacks Keven Mealamu and Jerome Kaino. The Prince, who is Patron of the Injured Players Foundation in England, had made time to visit the New Zealand Rugby Foundation at the centre as it supports catastrophically injured rugby players and their families. On day seven of his tour to New Zealand he received a formal welcome and was greeted by All Black legend Sir Colin Meads, who said it was a great honour to have him visit. He met a group of patients who paint with their mouths, with The Prince exclaiming “don’t tell me you have done that with your mouth” when he walked into the room. Earlier in the day he had visited the Turn Your Life Around Development Trust, TYLA, in South Auckland, which aims to inspire ‘at risk’ youth to lead a better life. During the visit, he joined the students playing pool and table football, and took part in ice-breaker activities to help discuss TYLA’s core values of facing up to challenges, making choices and facing the consequences. Later, he attended a reception, hosted by the Governor General at Government House, for emergency services and disaster relief personnel. He paid tribute to the country’s emergency services, as well as saying his thoughts and prayers were with the people of Nepal.